Credit: NASA/CXC/W. Forman et al. 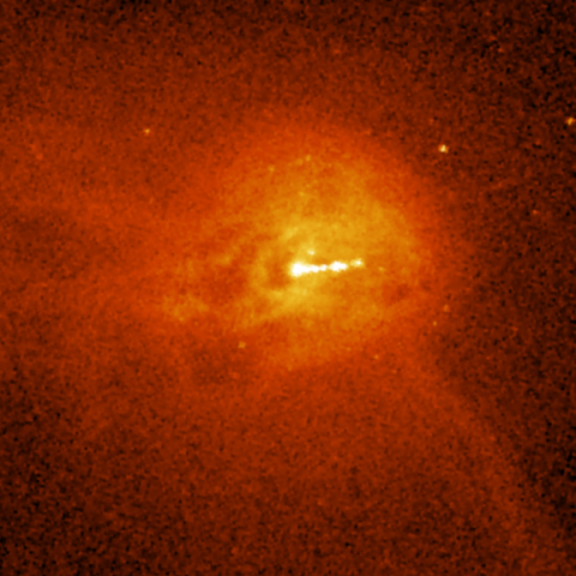 Two Chandra observations of the giant elliptical galaxy M87 were combined to make this long-exposure image.A central jet is surrounded by nearby bright arcs and dark cavities in the multimillion degree Celsius atmosphere of M87. Much further out, at a distance of about fifty thousand light years from the galaxy's center, faint rings can be seen and two spectacular plumes extend beyond the rings. These features, together with radio observations, are dramatic evidence that repetitive outbursts from the central supermassive black hole have been affecting the entire galaxy for a hundred million years or more. The faint horizontal streaks are instrumental artifacts that occur for bright sources. The accompanying closeup shows the region surrounding the jet of high-energy particles in more detail. The jet is thought to be pointed at a small angle to the line of sight, out of the plane of the image. This jet may be only the latest in a series of jets that have been produced as magnetized gas spirals in a disk toward the supermassive black hole. When a jet plows into the surrounding gas, a buoyant, magnetized bubble of high-energy particles is created, and an intense sound wave rushes ahead of the expanding bubble. These bubbles, which rise like hot air from a fire or explosion in the atmosphere, show up as bright regions in radio images and dark cavities in X-ray images. Bright X-ray arcs surrounding the cavities appear to be gas that has been swept up on rising, buoyant bubbles. An alternative interpretation is that the arcs are shock waves that surround the jet and are seen in projection. A version of this long-exposure image that has been specially processed to bring out faint features in the outer region of the galaxy reveals two circular rings with radii of 45 thousand and 55 thousand light years, respectively. These features are likely sound waves produced by earlier explosions about 10 million and 14 million years ago, respectively in M87-time (M87 is 50 million light years from Earth). The spectacular, curved X-ray plumes extending from the upper left to the lower right are thought to be gas carried out from the center of the galaxy on buoyant bubbles created by previous outbursts. A very faint arc at an even larger distance at the bottom of the image has a probable age of 100 million years. 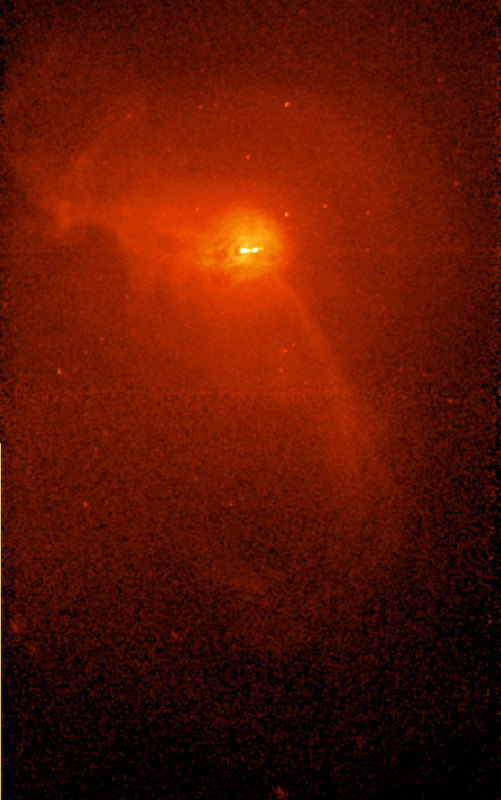 X-ray features similar to those seen in M87 have been observed in other large galaxies in the centers of galaxy clusters (see, e.g., Perseus A ). This suggests that episodic outbursts from supermassive black holes in giant galaxies may be common phenomena that determine how fast giant galaxies and their central black holes grow. As gas in the galaxy cools, it would flow inward to feed the black hole, producing an outburst which shuts down the inflow for a few million years, at which point the cycle would begin again. Credit NASA/CXC/W. Forman et al. Scale Image is 8.6 x 13.7 arcmin across.